WAAAAAAAAY MORE THAN A SURVEY TOOL. A RADICALLY SIMPLER WAY TO SURVEY, DESIGN AND VALIDATE WI-FI NETWORKS. 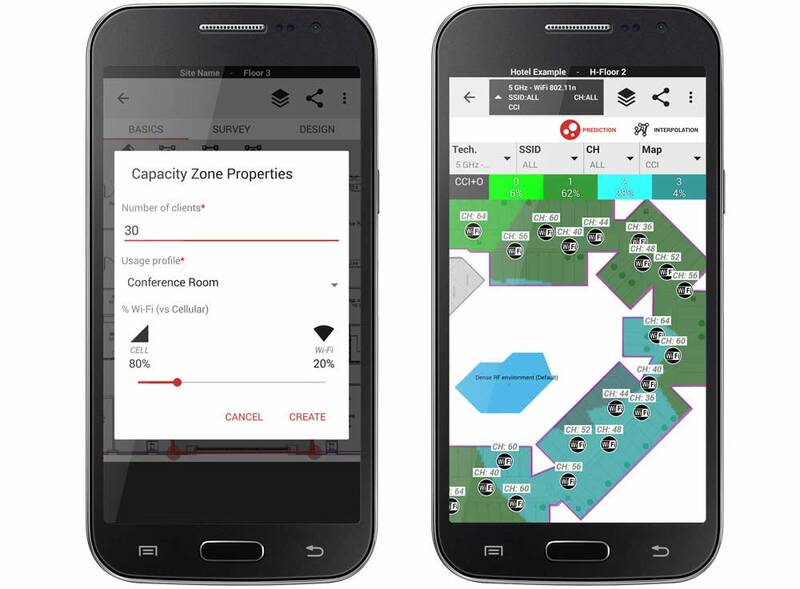 Take iBwave Wi‑Fi® Mobile on‑site with you to collect survey measurements, capture site visuals to geo‑located pushpins, and start your network design. 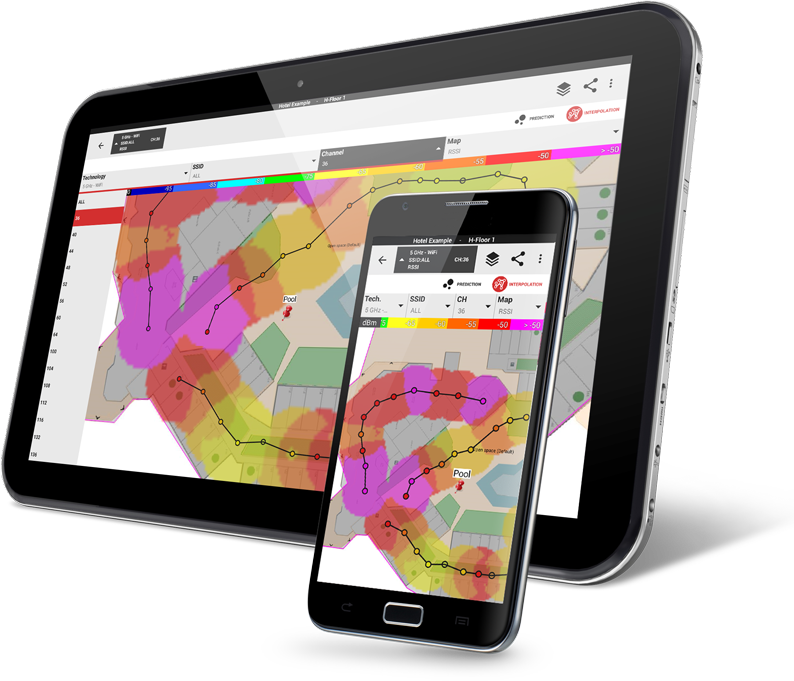 Save all of your site survey information in a single file in the iBwave Cloud where you or anyone on your team can easily access the file again to continue the design on either your mobile device or the more powerful PC version, iBwave Wi‑Fi®. 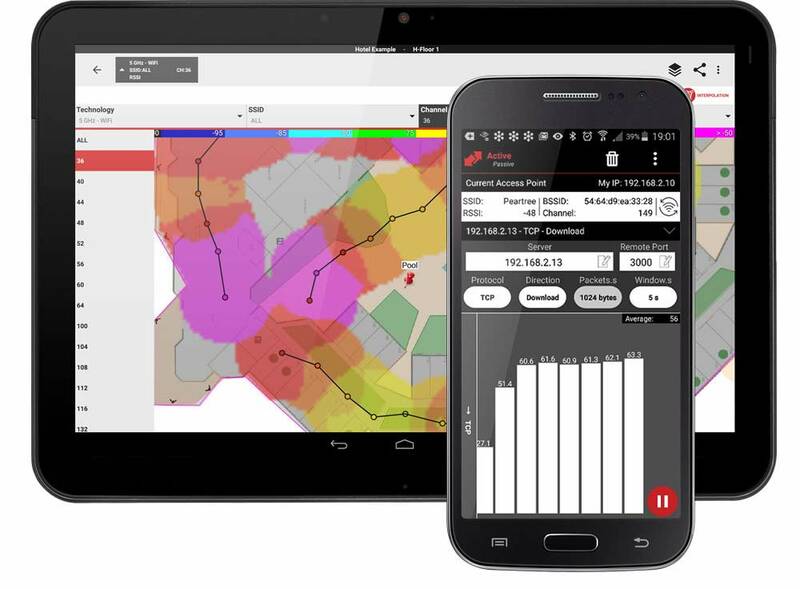 When you're done the design, take iBwave Wi‑Fi® Mobile back on‑site to validate your design with an active survey and troubleshoot issues with the design right there with you. What can iBwave Wi‑Fi® Mobile do for you? 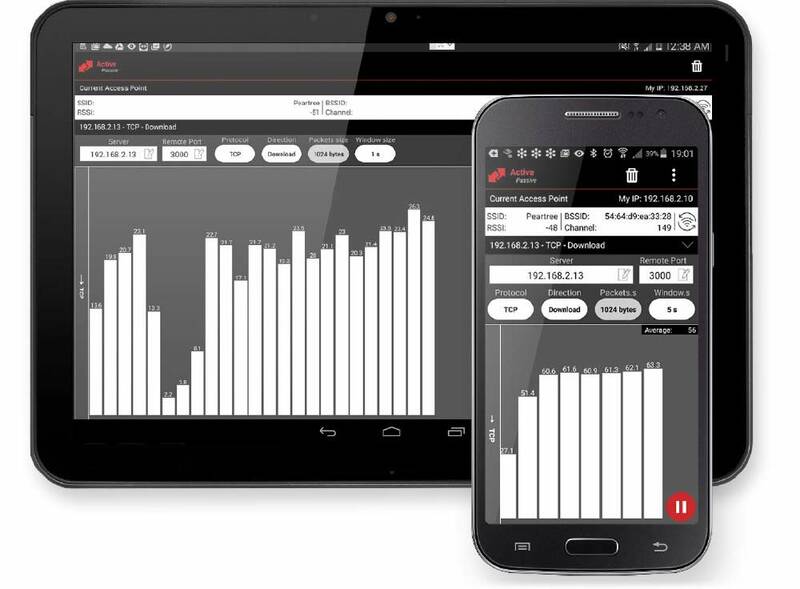 Set your laptop down and take iBwave Wi‑Fi® Mobile on‑site with you to assess the network's throughput and signal levels with active and passive surveys. Active Surveys. Use our integrated server to quickly spot check a network's throughout with an active survey. Passive Surveys. Conduct a start‑stop survey to collect the network's signal levels. Don't worry about lost data, all measurements are auto-saved as you go. 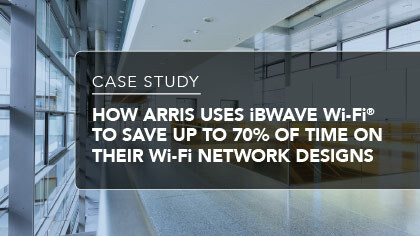 Seamlessly integrate with iBwave Wi‑Fi®. 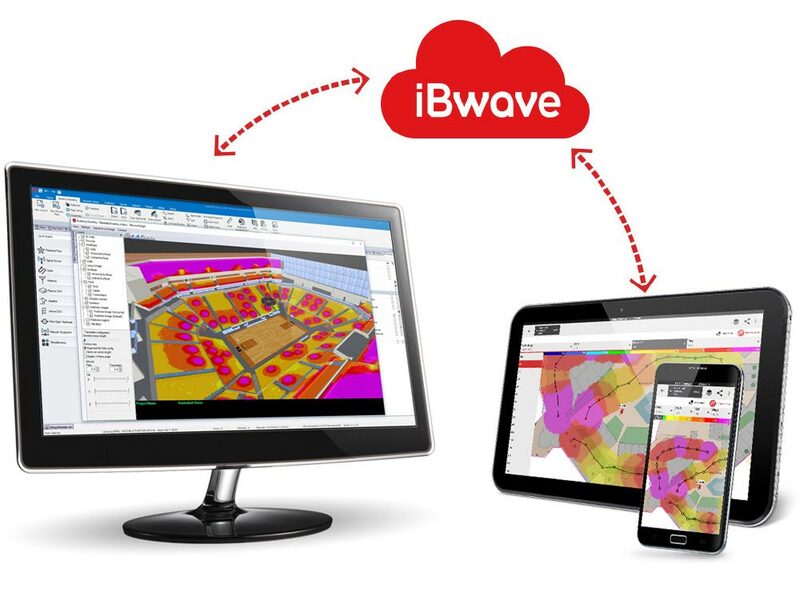 Save your survey data to the cloud and easily open them in your project in our PC version, iBwave Wi-Fi®. 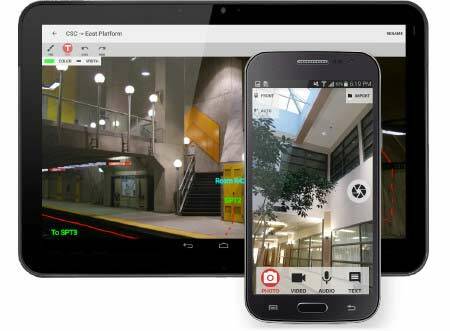 With iBwave Wi‑Fi® Mobile, you can capture the aesthetics of the site as you go by using your tablets camera to take photos and videos that are automatically saved to geo‑located push pins on the floor plan. You can also annotate each image to draw cabling routes, mark construction obstacles and clarify installation instructions. Capture site visuals from within the app. Launch your smartphone or tablet's camera directly from within the app to capture images, videos and audio notes to geo‑located push pins on the floor plan. Annotate images to clarify instructions and reduce post‑installation troubleshooting. Annotate site images with cable routes and installation notes to clarify installation for the install team. Provide a detailed annotations report. Generate an annotations reports that contains all captured documentation (images, notes, etc.) in one comprehensive document for the installation team. 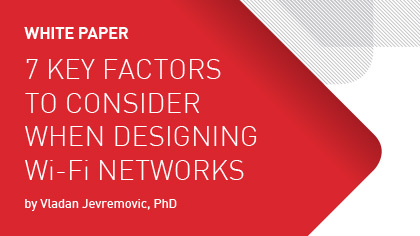 Reduce the risk of costly re‑design work post‑installation by starting the Wi‑Fi network design on‑site using your tablet. Use Auto‑AP placement or manually drag and drop access points onto the floor plan. Run prediction on‑the‑spot to get an idea of how your network will perform when installed. Place Access Points and Network Equipment. Select accurately‑modeled access points, network and installation equipment from our database of components and drag and drop them onto the floor plan. Alternatively, run Automatic Access Point Placement and then edit placement as you go. Route Cable and Model Network Equipment. 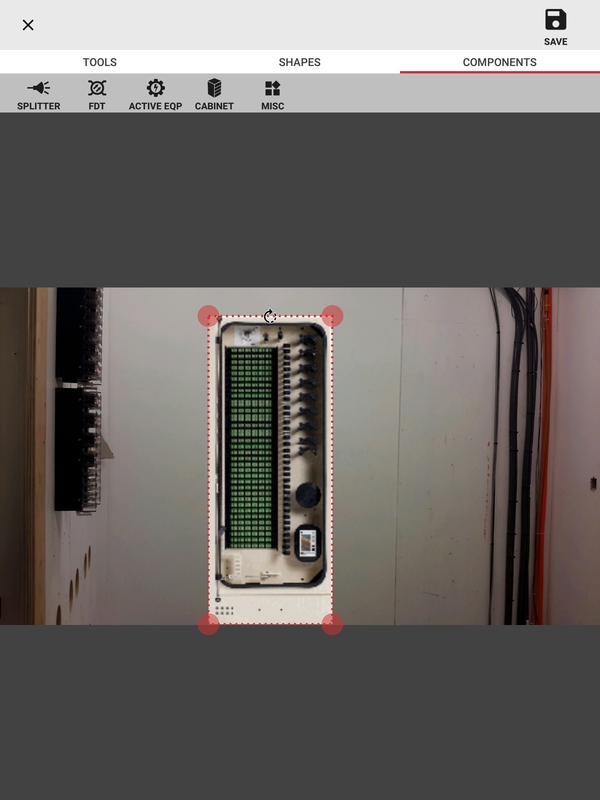 Route CAT5 cable, identify where cable trays and risers are to take advantage of the automatic cable alignment feature in iBwave Wi‑Fi®. Run prediction on-the-spot. Get an idea of how your design may perform by running prediction as you design (RSSI, Capacity, Throughput, SNR, Overlap Zone). Open and continue the design in iBwave Wi‑Fi®. Save your preliminary design to the cloud and then open it in the more powerful PC version, iBwave Wi‑Fi®, to finish the more detailed design in 3D. Easily collaborate on projects via the cloud. Never worry about how to share project files again - with iBwave Wi‑Fi® Mobile you get 10GB of storage in the iBwave Cloud to centralize all of your information. Save all survey information to the cloud. 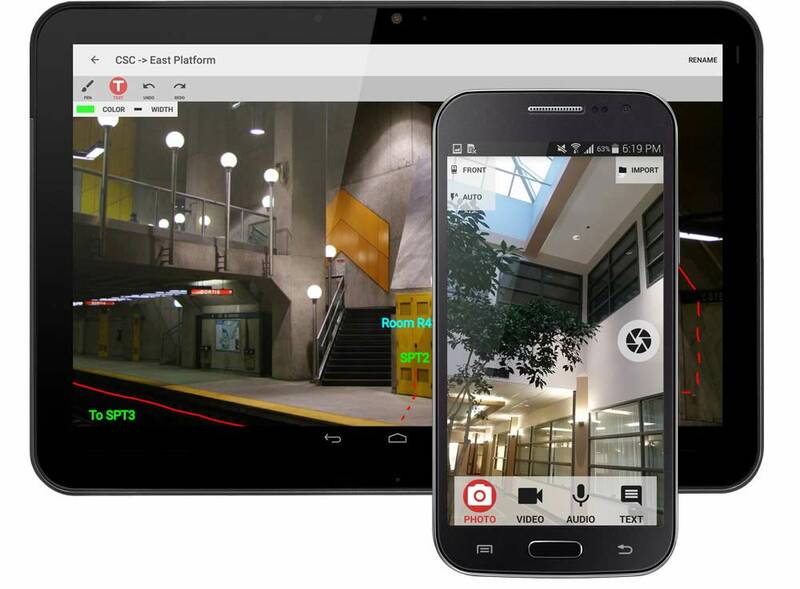 Save your project and all related documentation (survey results, design, images, videos, annotations) in a single file to the cloud where a colleague can access them and open them in either iBwave Wi‑Fi® or iBwave Wi‑Fi® Mobile. Access your projects anywhere, anytime. Don't worry about having to locate the files next time you are back at the site to validate the design or upgrade the network – they will be in the cloud and available to be accessed from anywhere, anytime. Always have access to the most recent files. With storage in the cloud you don't have to worry about keeping track of versions – versions are tracked and the most recent one will always be available to you or your teammates when you need it. Easily validate a design and send your customer a close‑out package. 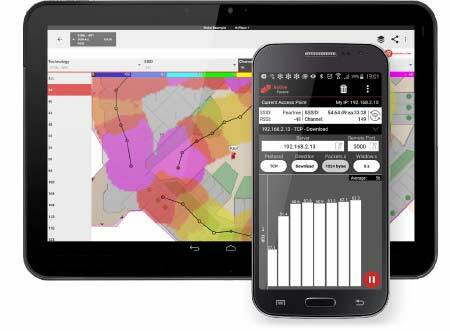 Take iBwave Wi‑Fi® Mobile back on‑site with you to validate the performance of the network. 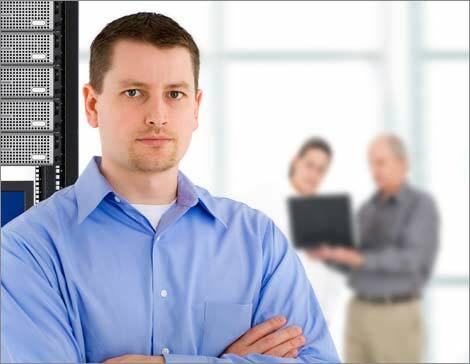 Run an active survey and have the design file with you in the case any issues arise and troubleshooting is required. Verify data throughput with an active survey. Run an active survey with our integrated server to verify the performance of the network design post‑installation. Easily troubleshoot any issues with your design file open on the tablet. iBwave Wi-Fi® is the best value Wi-Fi network design software on the market. Survey and design Wi‑Fi networks on your mobile device. * While iBwave Wi-Fi® Mobile should work on most Android™ based phones & tablets, we cannot guarantee that it will be compatible with all of them. For integration with 3rd party collection tools, you should first contact your respective vendor to determine device requirements. Due to a limitation of Wi-Fi scanning in Android 9, we advise you not to upgrade your Android mobile device to Android 9 for time being. In Android 9, Google has made improvements for battery life but they also severely limited the Wi-Fi scanning rates for applications (such as iBwave Wi-Fi® Mobile). Therefore if you upgrade to Android 9, the passive Wi-Fi survey and Wi-Fi scanning features of iBwave Wi-Fi® Mobile will become unusable.